I wonder if De Kuyper was any better back in the 30's than it is now? I really avoid buying this so called "Schnapps" because it's over sweet garbage that was given a new lease on life when crappy sweet shooters like the buttered pancake became all the rage. Sorry I'm not really in the mood to write much today, I'm busy trying to get stuff done around the yard so I can get some vegetables in the ground now that the weather is cooler. One thing I can say about this ad is the bottles were certainly cooler back then. Those really are nice bottles! 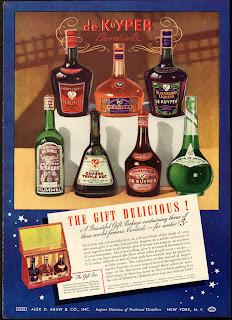 I have an Old Mr Boston Bartender's Guide (a 1940s edition) that has lovely color pics of their bottles (and many mighty odd drink recipes too, which I intend to write about during the holiday season).